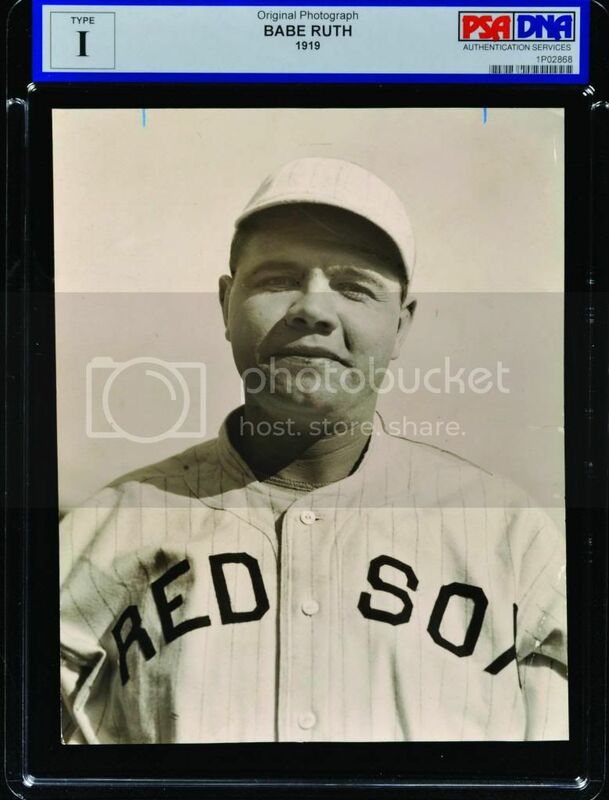 Let's show our Babe Ruth Boston Red Sox era pieces...photos, cards, pins, bats, autographs...what's out there? Here is my perfectly centered with sharp corners example. Last edited by vintagecpa; 11-03-2017 at 10:00 AM. This thread is right up my alley. 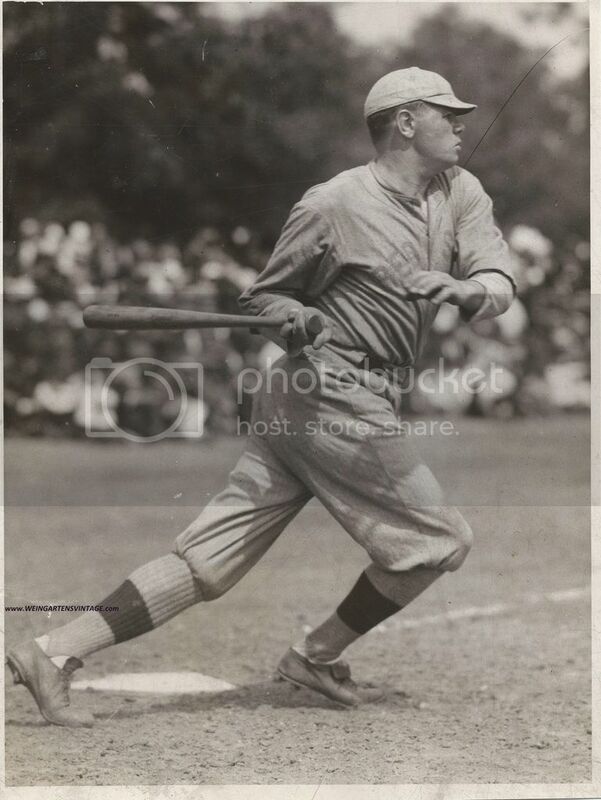 Here is a Type 1 photo from 1915. 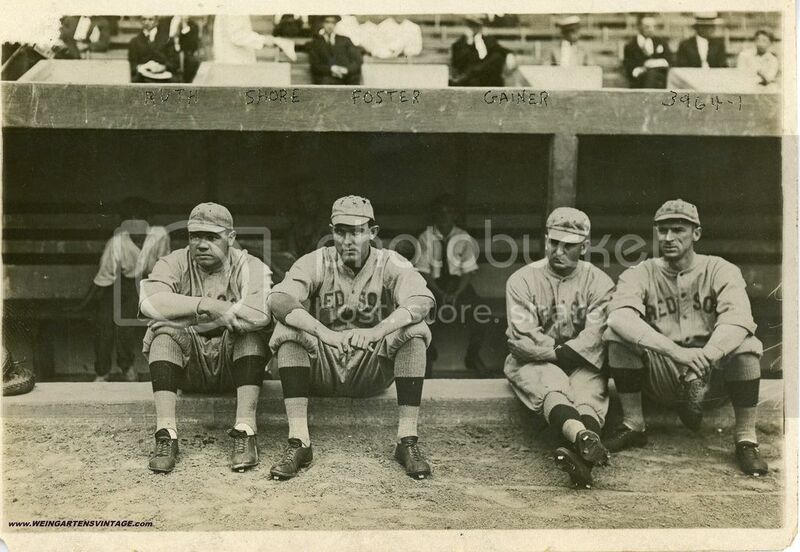 It was taken at the end of the season at the Polo Grounds. There is a partial Fatima sign on the right. Last edited by Baseball Rarities; 11-03-2017 at 08:11 PM. How funny, there's a Piedmont billboard on the wall in the background. Program, type 1 photo, scorecard, and Midweek Pictorial paper. Amazing photo! Type one? Year? Type 1. Year uncertain; it's somewhere 1915-19; PSA couldn't pinpoint beyond that. Could be a rookie image but not certain. 1915 dated PSA type 1 PHOTO-"The Mona Lisa"
Last edited by Forever Young; 11-07-2017 at 01:26 PM. 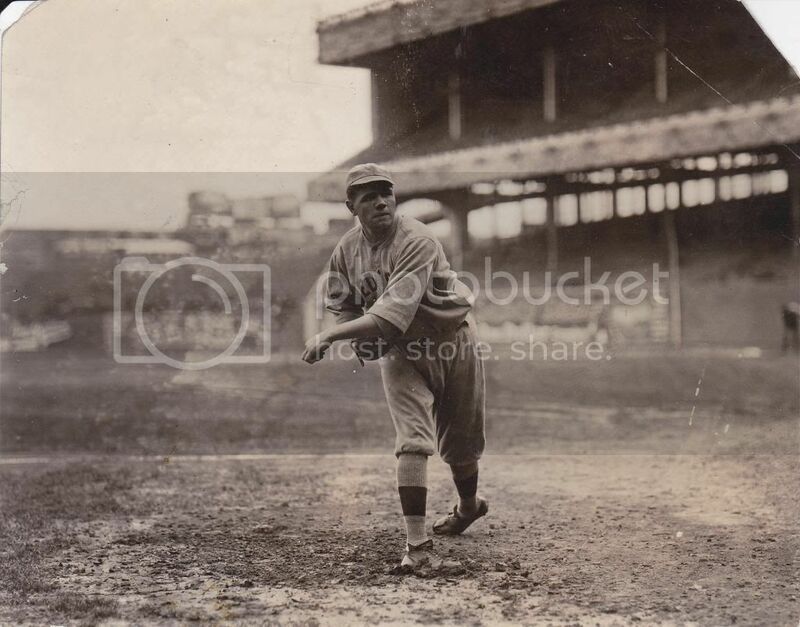 1914, Ruth on the mound at Fenway for his second game in the Majors. 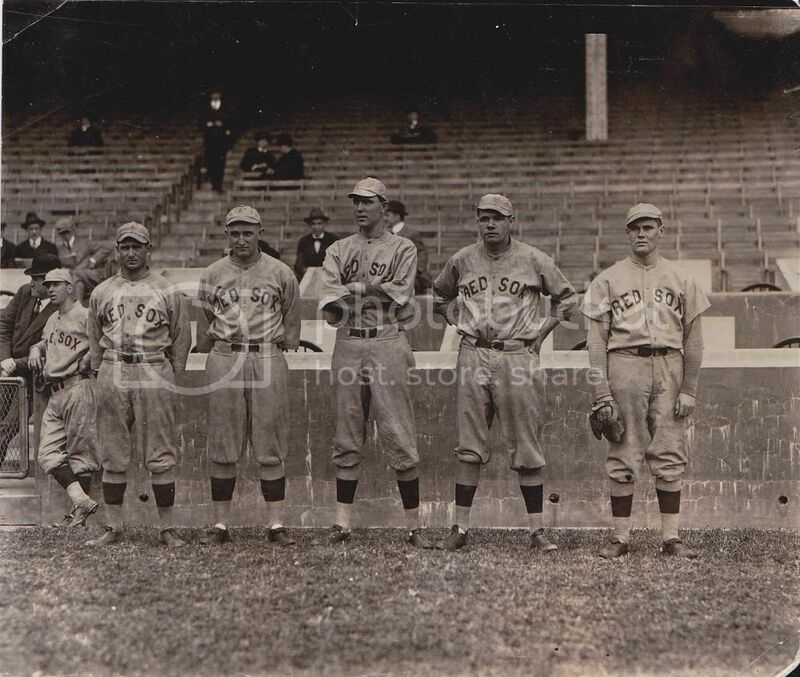 The earliest, and only 1914 original, Ruth Red Sox photo known to exist. ^^^ I love that unique stadium and foul line in Left!! Last edited by Forever Young; 11-06-2017 at 01:29 PM. I know that photo.. very very nice. Lots going on.. any story behind it? 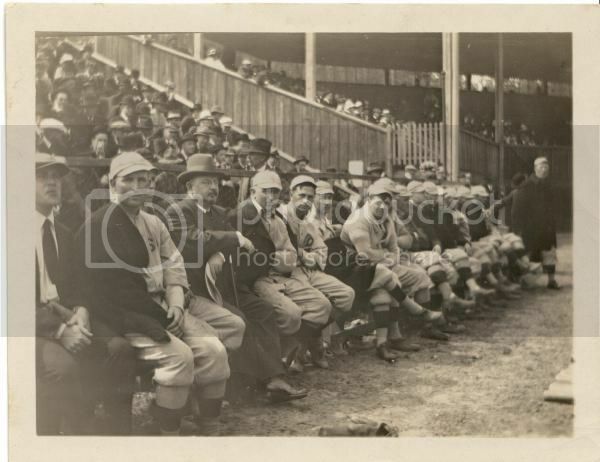 Here is a single shot of Ruth in 1915 spring training(first known single type 1 shot of Ruth in Red Sox uni)and group shot with the babe sticking out as usual. I’ll try to upload with better/clear scans later. Last edited by Forever Young; 11-14-2017 at 04:14 PM. 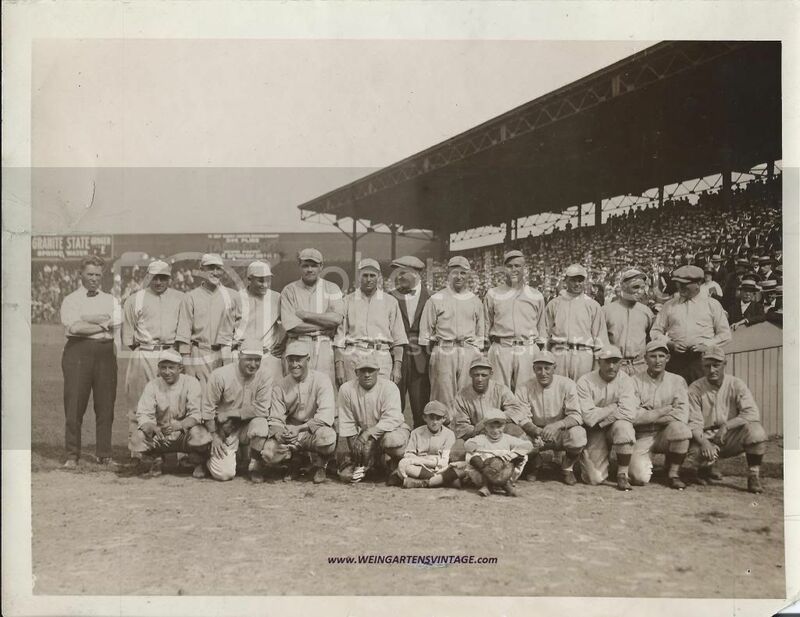 Here is a single shot of Ruth in 1915 spring training and group shot with the babe sticking out as usual. 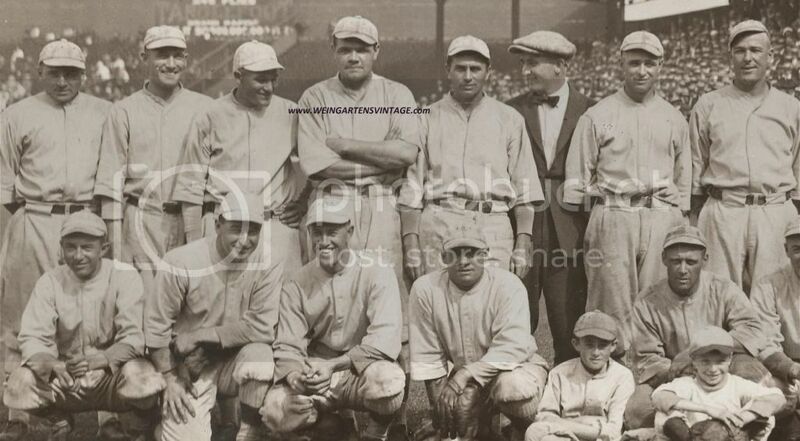 Seems like the Babe always had a knack for standing out in group shots - even in the early days. 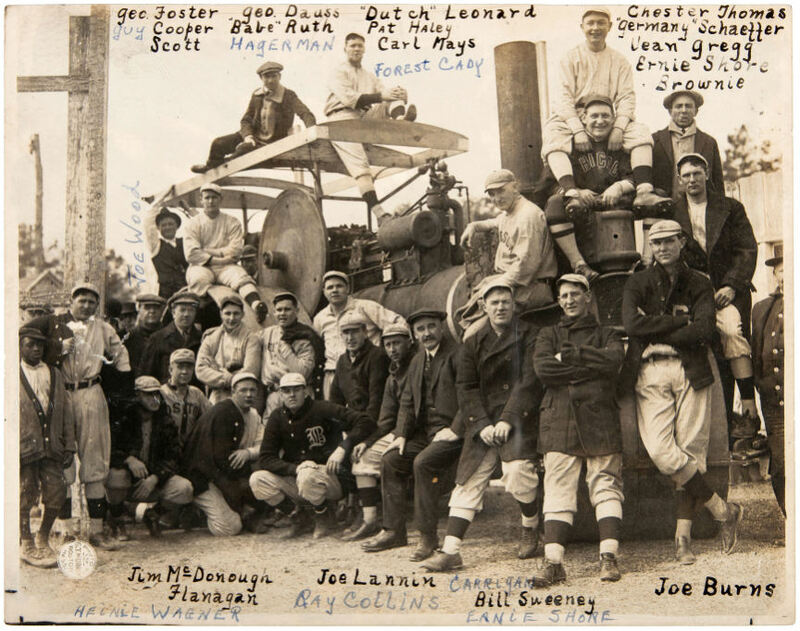 Another Type 1 from 1915.
damn Jeff..that team photo is killer!! As far as I am concerned, this thread is the cream of the crop in the world of baseball photos and cards. Creme de la creme as they say. All of you guys holding all these items have baseball history of the highest order in their finger tips. Just amazing museum pieces. All of them. Last edited by Snapolit1; 11-06-2017 at 09:52 PM. Last edited by pcoz; 11-07-2017 at 06:37 AM. Last edited by Forever Young; 11-07-2017 at 01:14 PM. LOOKING AT PHOTOS PROB OF THEMSELVES IN U AND U ARCHIVES. Last edited by Forever Young; 11-07-2017 at 01:15 PM. wow so many great item here. just for my info. On the VCP i don t see recent sales of the m101-5 ruth rc in psa auth or psa 1 in bad condition . 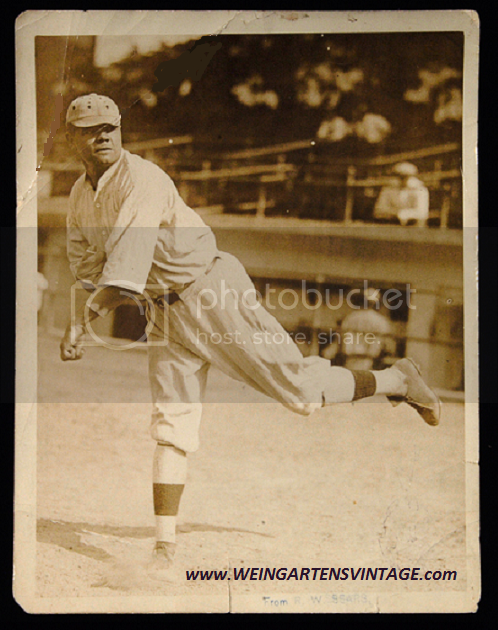 Those are two fantastic single Ruth rookie photos ... both on my “hit list” at one time. Very nice. One man's loss is another man's gain... or something to that effect. 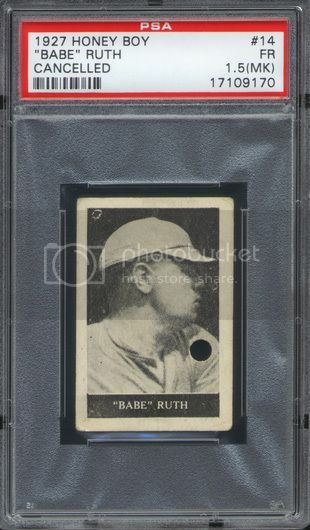 Here is another Ruth Type 1 in my collection. Last edited by Forever Young; 11-07-2017 at 04:38 PM. I am just thankful that you left a few for the rest of us. Last edited by Baseball Rarities; 11-07-2017 at 07:28 PM. Here is a couple more that I believe are pretty special historically and 1 of a kinds(not seen others). 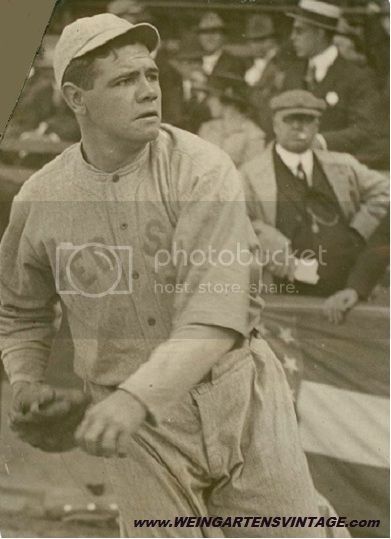 1) Game 1 of the 1918 WS where Babe Ruth was a pitcher and won(masterpiece 1-0).. It also marks the "first time" the star spangled banner was played at a game. The historical significance/content is off the charts. 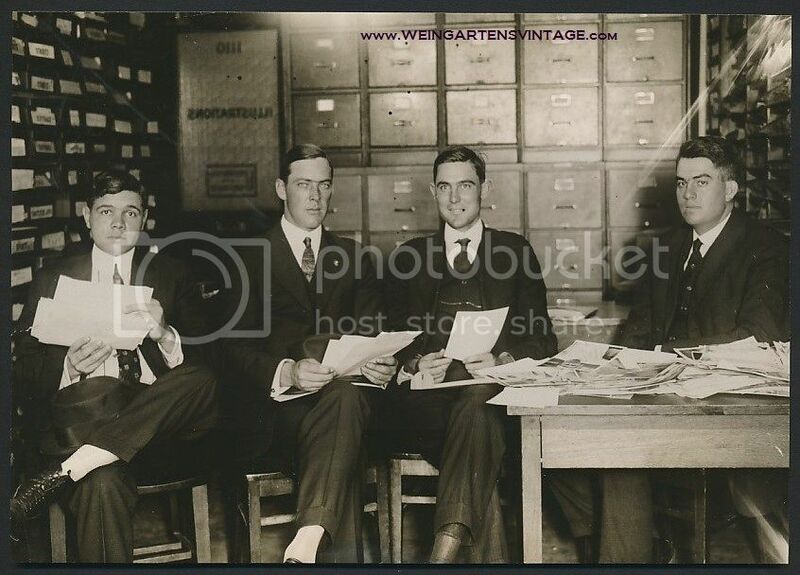 2) 1918 Rex Sox team. Of course the last time they won the WS with Ruth and the curse started just after. It is crystal clear and Ruth looks like a BA. Last edited by Forever Young; 11-08-2017 at 11:30 AM. Pretty awesome photo . . . .but . . . it's a family photo and not an iconic shot of Babe as the greatest homerun hitter of all time. 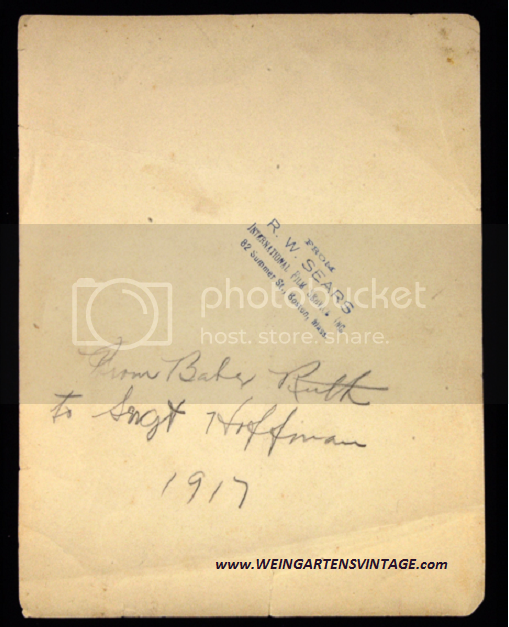 Might be a good investment but personally speaking I'd deploy $65,000 on other Ruth rarities/photos. I'd have bid but all I could think was "Baztacula". The clarity of this photo is amazing! I wonder what he’s wearing on his wrist? You know, I have never noticed that before. Interesting.. tape?? The wrist thing looks very cool; tape or a leather band? Amazing collection Ben! Which is your favorite if you had to pick one?